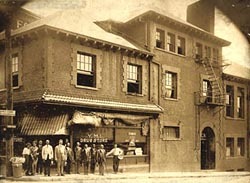 During the late 19th and early 20th centuries, the area surrounding the Young Men's Institute (YMI) was the center of the business district for Asheville's African Americans. George Vanderbilt built the YMI in 1893 to serve as the equivalent of the YMCA for black men and boys who helped construct his palatial house during the 1890s. Many of these masons, carpenters, plasterers and laborers also built the YMI. Local architect Richard Sharp Smith designed the YMI building using a simplified English Tudor Cottage style similar to many of the buildings in Biltmore Village and buildings on the Biltmore Estate. The prominent architectural features shared by the Biltmore Estate, Biltmore Village and the YMI are pebble-dashed walls, red brick quoin trim, multi-pane windows and hipped roofs. It was Vanderbilt's vision that the building's users would buy the YMI building from profits earned by the stores and offices on the first floor. After much effort on the part of the African American community, the Vanderbilt estate was paid $10,000 for the building in 1906. The multi-use building was the center for social activity in the community where it supported professional offices, a public library and the YMI Orchestra. While the YMI flourished during segregation, integration signaled a new era in the country and the YMI ceased to be the focal point of social life for Asheville's African Americans. Following a period of decline in the 1960s and 1970s, a coalition of nine black churches, with the support of both the black and white communities, bought the YMI in 1980. The building was restored and reestablished as the YMI Cultural Center. Since 1981, the YMI Cultural Center has developed a variety of cultural programs and exhibitions of art and artifacts from Asheville to Africa preserving the heritage of African Americans in Buncombe County. 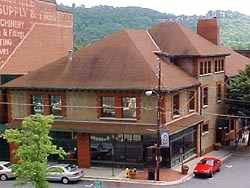 The Young Men's Institute Building is located at the corner of South Market and Eagle sts., south of downtown Asheville's Pack Square. The exhibit rooms are open to the public Monday-Saturday, 10:00am to 5:00pm. Donations are accepted. For further information visit the YMI Cultural Center's website or call 828-257-4540.